“Learning to Drive” is a transition story for the two main characters. Patricia Clarkson is Wendy, a successful book critic in New York City. whose husband has just walked out on her and seeks a divorce. Devastated, she looks to resume her life, and part of it means finally learning to drive. Darwan (Sir Ben Kingsley) is her driving instructor, a Sikh from India going through a transition of his own. The two disparate souls help each other in essential ways, and at the same time weather the storm of some extreme life changes. 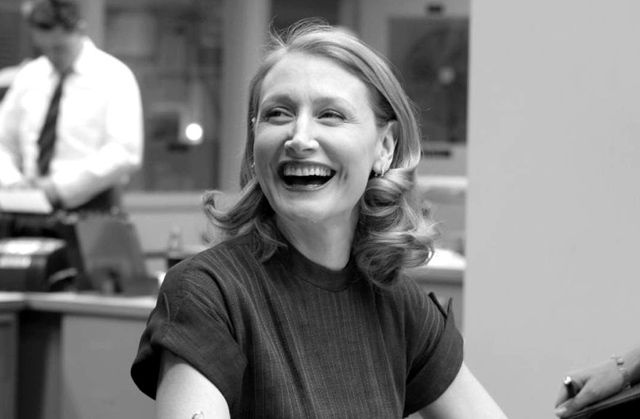 Patricia Clarkson was born in New Orleans, and studied drama at Fordham University, getting her Masters of Fine Arts from the Yale School of Drama. She broke into the movies in a big way, playing opposite Kevin Costner in the 1986 classic, “The Untouchables.” She has had a solid and memorable career track in diverse character roles in “Everybody’s All American” (1988), “Jumanji” (1995), “The Green Mile” (1999), “Far From Heaven” (2002), “The Station Agent” (2003), “Pieces of April,” (2003, nominated for a Best Supporting Actress Oscar), “Good Night, and Good Luck.” (2005) and “The Maze Runner” (2014). HollywoodChicago.com: You were asked to relate so many emotions in the Wendy character. Which one do you think suits her best as a survival instinct during her crisis, and why? Patricia Clarkson: I honesty think her feeling of being superior is what ultimately lifts her out. It’s the trait in her that really needs to break down, but initially she uses that type of confidence, her superior intellectual abilities, because even though it fails her in the marriage it saves her emotionally, and allows her to pull out of the problems of the situation. HollywoodChicago.com: In the backstory of the marriage depicted in the story, what did you conclude was the overriding problem that eventually snapped it, and had it really gotten too late to repair, given if there wasn’t another woman involved? Clarkson: There is a key line in the early part of the film, where her husband tells her, ‘you never looked up, you were never here.’ She was a wife, a good mother, but was she really present? That was the problem. Sometimes, the waters run too deep and the damage has built up for so long, it can’t be repaired. I think at one point in their lives they did have a true and profound love, but it can fade. It can go. HollywoodChicago.com: Much of the man/woman dynamic is biological in nature, but because we’ve evolved as emotional and intellectual creatures, we have to meet each other on that level as well. How is emotion and intellect as important in a long term relationship as the biology, in your opinion? Clarkson: It’s essential. That’s what I love about Wendy, she’s a brilliant woman who lives a deeply intellectual life. She is led by that intellect, and often not by her heart. When we neglect that emotional side of ourselves, we are not whole. This is what drew me to the story, what happens to a woman who suddenly has to live an emotional life? Who has to deal with a kick in a gut – what does visceral look like with a really smart woman? HollywoodChicago.com: Where in their relationship do you think Wendy and Darwan most profoundly connected, and how did you and Sir Ben seek to exploit that connection in the story? Clarkson: It was such a fine line and subtle connection, it’s finely etched. It’s not done in broad strokes or large shifts that occurred. We had to be very careful to honor that subtlety. I do think at the end of the day it was about love. The connection is what they can each learn from each other about love. Is there really anything else? HollywoodChicago.com: Like Wendy, you are a person of deep intellect and passion for her profession. How does a deep perspective and depth in your soul help you in understanding the people behind your various character roles? Clarkson: There are a lot of lonely nights. [laughs] I’ve lived through a lot of things, and at my age I’ve experienced some turning points. What is essential for me as an actress is that the preparation I do is always the emotional preparation – how do I marry my emotional life to a particular character. Because the time you have to shoot is often very short, and you have to have everything available. There is no time to really find ‘the truth of the scene’ that much. It’s a painful process, and even in this film – which has its lighter moments – shooting it was difficult. But that is my job, and my job to make all her mercurial moments in her life come alive. It’s music, and I didn’t want to miss a note. I had to willing to expose my own emotional ups-and-downs, my failures. It had to be available to me while we were shooting. HollywoodChicago.com: This is a story mostly of a dissolution of a marriage and the road to recovery for your character. What do you think is flawed about the concept of modern marriage, and is it an institution that you predict will survive in the societal structures of the future? HollywoodChicago.com: Well, in a sense, that’s why I’m asking you the question. Clarkson: That’s interesting, I suppose I have an objective view on it. Marriage is a beautiful, life affirming institution for many people. But sadly, in certain lives, it will continue to fail, and the possibilities for fail are infinite. But I do think it’s an essential part of our society, and our lives, I just chose to steer clear of it. HollywoodChicago.com: Which of the many film directors you’ve worked with really surprised you versus the reputation they had before you were on set with them, and why? Clarkson: It probably was Martin Scorsese, when I worked with him on ‘Shutter Island.’ He was actually very…human. [laughs] He is so present on the set, and always in the moment. He loves actors, and he wanted the best from us all the time. That surprised me, because for some reason I thought it would be a more frightening environment. It turns out it was one of the most conducive environments I’d ever been in. HollywoodChicago.com: You’ve been in several films in which you portrayed a woman of the mid twentieth century. What advantages do you think you’ve had in your era versus their mode of life? Clarkson: I think woman in my mother’s generation, for example, had to make different choices and sacrifices. My generation has been given so much more, we’re lucky as hell. Many of us never had to make the choices of my mother, we had the opportunity to ‘have it all.’ We’ve been breadwinners, high powered executives, we’ve had children – both naturally and through adoption – we’ve had opportunities in marriages, both straight and gay. We can have it all, but as the film points out, we also can forget how good that is. HollywoodChicago.com: As you progress in the life cycle, how do you feel you redefine yourself beyond your acting life? What creative element of yourself expresses Patricia Clarkson the person? Clarkson: You mean, do I paint? [laughs] Sadly, I don’t really have a creative element outside the acting profession. Because for me it’s such a consummate process, and takes a toll on me ultimately, I like having some breathing space when I’m not working. I like letting the ‘other life’ go. HollywoodChicago.com: Because we were born six months apart, what do you think our generation has contributed to society in our time on earth? Clarkson: We are a generation that has raised children, for the most part, who are accepting, tolerant and loving. We’ve raised great kids.